Sally Kim knows a thing or two about beauty—she’s more than done her homework. The incredible young entrepreneur created a beauty empire at the young age of 25 focusing on the fundamental nutrients in a Korean diet. She has an incredible story and her product is truly amazing. She also has a book on the way, The Collagen Glow. After a terrible cooking accident that caused Sally to suffer severe burns all over her arms, she became obsessed with finding remedies to fix her skin outside the realm of painful surgeries and lasers to heal her skin from the inside out. 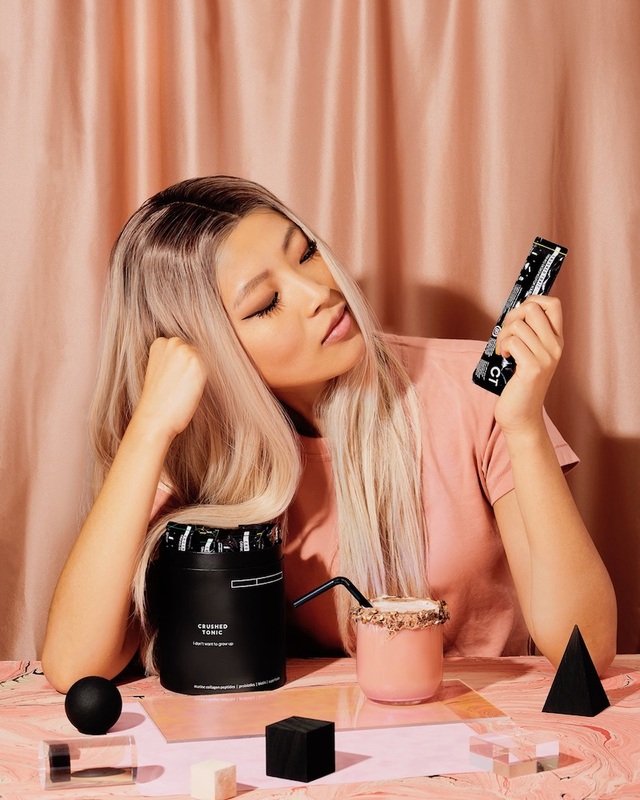 Korean beauty is obviously a huge trend, but it dawned on Sally that part of why Koreans have such incredible skin is due to a diet that consists of foods very high in collagen. She looked into her own heritage and began creating her own concoctions. In a few weeks, she began to notice radical changes in her hair, skin, and nails… thus, Crushed Tonic was born. Tell us about the genesis of Crushed Tonic. SALLY KIM: It all started when I got burned from a cooking accident. The oil melted the skin off both of my arms instantly, and I had to turn to a ton of prescription ointment and silicone patches only to find out none of it really did much for me. Unimpressed by the options out there, I ended up turning to the internet to find ways to heal my skin. After some research, I discovered that ingesting collagen was extremely beneficial for our skin (and hair, bones, joints, the list goes on). I was super fascinated, especially because I always thought collagen was something that was topically applied or injected—and started drinking it every day. After just a couple weeks, I saw incredible changes not just on my burns, but my entire skin, head to toe, and also my hair. Turns out, collagen is something that’s in our own bodies —actually the most abundant substance in our bodies second to water—and our bodies stop producing it as much when we are in our mid 20s. Drinking extra collagen, however, offsets that decline, returning your skin and hair to what used to be. I then tried to evangelize it to my aging parents and family, and this was where I saw the problem. No one wanted to take collagen as often as I did, for how it tasted (and to be fair, most collagen powders do have an unpleasant taste—it is often gamey tasting, like any other protein powders are); and had I not been burned, I probably wouldn’t have drunk it so regularly either. But knowing how amazing it was for you, I had to have my parents take it. So I began to flavor each mix with specific superfoods that they liked, so they would drink the collagen with the beverages they were already drinking every day anyway (matcha for my mother, coffee for my dad, and hot cacao for my brother). And after tasting and testing for months, getting it so that the collagen was virtually unrecognizable in the flavor, and seeing my friends and family drink Crushed Tonic raving about how amazing it tasted—that’s when Crushed Tonic was born. What was the most challenging part of starting your own brand? SK: It was challenging to create a product that could be integrated into almost everybody's lifestyle, with branding that resonated with more than just one demographic. It wasn’t until after months of research and studying hundreds of peoples’ diets that I finally landed on three different prototypes of crushes, with the goal that there would be at least one crush out of the three that worked for just about anybody—whether they were coffee drinkers, smoothie makers, or tea lovers. The original crush, a virtually flavorless and naturally sweetened blend for a boost of energy, the matcha crush, an herbal, green tea blend for those looking for a boost of focus, and the turmeric crush, a spice-infused chai-tea like blend with cinnamon and ginger for those looking for a boost of immunity. I wanted to make sure that there would be no excuse for why someone wasn’t drinking collagen everyday—and for us to get to that point, we had to keep listening, pivoting, testing, and learning. After the formulation was done, we went through a similar process perfecting our packaging. We wanted it to be welcoming to everyone—both men and women, of all ages, from all walks of life. Many skincare brands are gender-prescriptive, with marketing language/branding and colors that are alienating to those outside of that box; we wanted everyone to be able to carry it around, without feeling uncomfortable that someone would see them with it. We had to keep evolving, incessantly! It was all worth it though—one of the happiest moments I’ve had since founding Crushed Tonic was when I heard that one of my customers had gotten her parents, her older brother and her younger sister all hooked on CT.
SK: I like to spritz my face with rosewater the second I get out of bed—it’s refreshing and hydrating. Then, I make myself a warm matcha crush latte. I microwave a mug of coconut milk for about 2 minutes in the microwave. While the milk is getting heated up, I pour a matcha crush into a separate water canister with about 3 oz of water. I then shake it all up so the crush has dissolved perfectly in the water into an elixir. Then, I'll pour the elixir into the warmed up mug of coconut milk, and stir it in. Every crush has 10 grams of protein (and drinking collagen is like drinking bone broth)—so I’m checked off on the breakfast front. I’ll then sit down to work after a few minutes of meditating, and listening to my favorite songs. Currently, I’m jamming to indie electronica the most. Korean Beauty is exploding right now. What do you think it is that’s gaining so much popularity? SK: There are a few reasons for this, but I believe the biggest driver to be that Korean products—especially Korean skincare—are based on science, and often packed with functional, innovative ingredients that are well ahead of the curve and market (an anti-aging serum formulated with snail creme and cacti clinically proven to increase your skin’s collagen levels). It also helps that America is waking up to the wellness scene, and Korean beauty, at its core, is wellness for your skin. 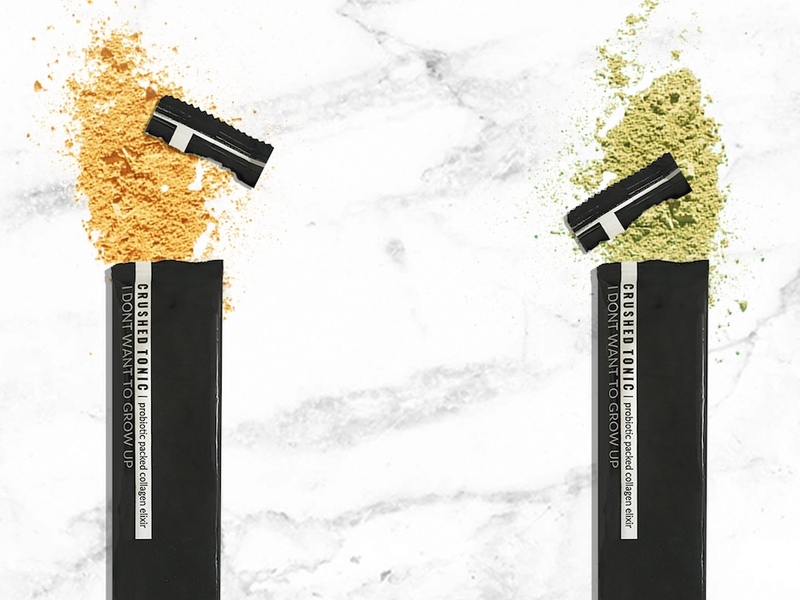 Yes, we still love the intensity pigmented eyeshadows and radiant highlights, but as much as we are caring about what we put on top of our skin, we are now, more than ever, caring about what’s happening to our skin underneath it all, at the cellular level. What’s the best beauty tip you’ve ever been given? SK: That you are what you eat. My biggest skin concerns—dark circles, peeling/dry skin—could only be hidden for so long with makeup. But when I started turning to ingestible skincare and working on my skin from within, I no longer needed to depend on makeup. It made me feel so confident, being able to step out without having to turn to foundation or concealer. And the best part? When you start taking care of the health of your skin, the transformation is permanent. It doesn't come off with a wipe! What’s your favorite thing about being a female founder? SK: I love that I can be one of the reasons that other women and girls can know that they too, can chase their passion, whether it is publishing their own book, or building their own company. Whenever I receive notes from younger girls who tell me that they are now more confident in following their dreams, I become even more grateful for what I do.